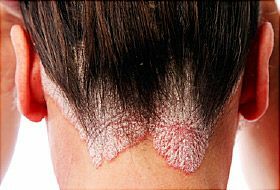 Scalp psoriasis is a common skin disorder that makes raised, reddish, often scaly patches. It can pop up as a single patch or several, and can even affect your entire scalp. It can also spread to your forehead, the back of your neck, or behind and inside your ears. You can’t catch scalp psoriasis from another person. As with other types, we don’t know what causes it. Doctors believe it comes from something wrong with your immune system that causes skin cells to grow too quickly and build up into patches. You may be more likely to get scalp psoriasis if it runs in your family. About half of the estimated 7.5 million Americans with psoriasis - which can affect any skin surface - have it on their scalp. Sometimes the scalp is the only place they have it, but that’s uncommon. Scalp psoriasis can be mild and almost unnoticeable. But it can also be severe, last a long time, and cause thick, crusted sores. Intense itching can affect your sleep and everyday life, and scratching a lot can lead to skin infections and hair loss. Scalp psoriasis itself doesn’t cause hair loss, but scratching a lot or very hard, picking at the scaly spots, harsh treatments, and the stress that goes along with the condition can lead to temporary hair loss. Fortunately, your hair usually grows back after your skin clears. If you have any of these symptoms, see your doctor or dermatologist. He may simply take a look or do a skin biopsy to rule out similar conditions like seborrheic dermatitis. The first line of defense is treatment you use directly on your skin: medicated shampoos, creams, gels, lotions, foams, oils, ointments, and soaps. You can get some of these products over the counter, but stronger ones require a prescription. To work, these treatments must be put on your scalp, not just your hair. Follow the directions exactly until your skin heals, which can take 8 weeks or more. Once your psoriasis has cleared, you can help keep it from coming back by shampooing regularly or twice-weekly with a product that has coal tar or other medications. If you have mild scalp psoriasis on a few areas, your doctor or dermatologist may consider injecting steroids directly into those areas. If your symptoms don’t respond to topical treatments, phototherapy with a laser or non-laser light source may help. For example, the excimer laser focuses high-intensity light on affected areas and avoids the surrounding healthy skin. Ultraviolet (UV) light -- sometimes delivered with a hand-held device called a UV comb -- can be used to treat the entire scalp. If you have very thin hair, or a shaved head, your doctor may recommend that you go out in natural sunlight for brief periods. Since these medications can cause serious side effects, including liver damage, they require a doctor’s close eye. It's also important to know that oral vitamin derivatives are different from -- and more powerful than -- vitamin supplements bought over the counter. Ordinary vitamin A and D supplements do not help. There is no cure, but many treatments can help symptoms, control flare-ups, and prevent it from coming back. People who follow their treatment plan rarely have to endure severe scalp psoriasis for long. Psoriasis support groups can also offer valuable tips to help medical treatments work better and ease the stress and sadness that this common condition can cause. American Academy of Dermatology: "What Is Scalp Psoriasis?" American Academy of Dermatology: "Understanding Scalp Psoriasis May Head Off Hair Loss." Medscape: "FDA OKs Biologic Guselkumab (Tremfya) for Plaque Psoriasis." National Psoriasis Foundation: "Scalp Psoriasis."